Being at the beach with all the crowds the easiest mode of transportation other than walking or a bicycle is a small scooter. It is easier to get around all the traffic and is great on gas. Most basic small scooters don’t have a lot of storage. 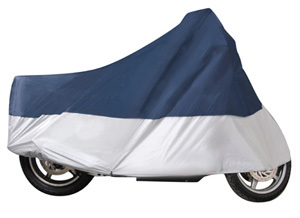 Here is a scooter bag that will fit on the Buddy 50 125 or 150. 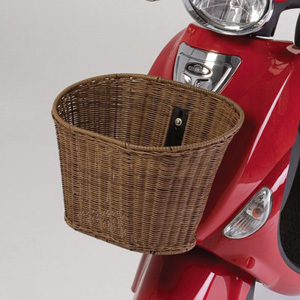 It is wicker and will mount to the existing holes on the front of the scooter. Great to throw a few towels and water bottles to go to the beach with. I have seen so many scooters on the road these days since the weather has been so nice. The one thing that stands out is that most of them have a plastic milk crate on their scooters. Here is a scooter bag that is a good alternative . It is durable, made of metal and affordable. This 13″ x 13″ x 9.75″ is perfect for carrying books, groceries or practically anything you might need with you. All you need is a rear rack. Easy universal mounts makes it easy to install. I find that this motorcycle tool bagGreat little Bag is not only for my motorcycle. Whenever I have to carry a lot of small things at one time this bag is perfect. If I have to have a lot of small tools to help a friend, I just put them in and go. If I need a bag for my cosmetics for an overnight trip it is perfect. This bag is soft leather and has a small pocket, easy to store anywhere. I also looks great on the bike. I was going home today and saw a motorcycle carrying a satellite dish. It was an ultra classic and it was easy to see it would not fit in any of the bags. He had the dish sitting in the rear seat with sheet tied around it. I he had a motorcycle cargo net he would have been able to use it to secure the dish to the seat. Nothing flapping in the wind and the dish would have stayed in place. Do you do a lot of traveling? Whether it is by car or bike or plane here is a Sissy bar bag for you. Made of leather for durability. It measures 16 x 22 1/4 x 11 for plenty of room in the inner compartment, with outer pockets for all the small items you need to get to at a moments notice. 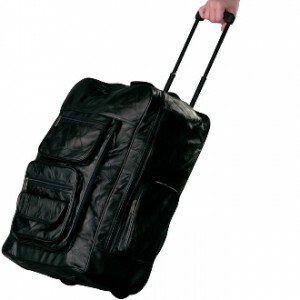 Has wheels and a handle for rolling around the airport . Or hide the handle behind the zippered pocket. 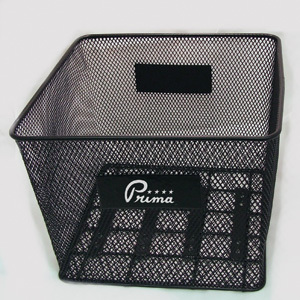 Now you have a bag that fits in the car or sits well on the bike. looking for that classic look? Something that people will take a second glance at? 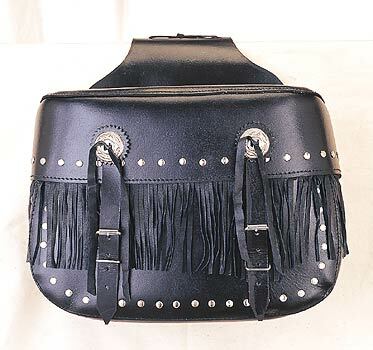 Here is a motorcycle saddlebag with the conchos, studs and fringes that can do it for you. It is an easy zipoff bag with a heavy duty velcro cover and lock. Plenty of room in this 15.5″ x 6.5″ 12″ on the inside, with four pockets. It also has four tie down ribbons on each side for an extra secure fit. Don’t worry about getting anything wet, it is waterproof. Living at the beach you are close to a lot of activities. One of the things is diving. Whenever the opportunity arrives it is good to have all your gear together. Here is a good motorcycle barrel bag to have. It measures 21″ x 12″ x 9″ for plenty of room. 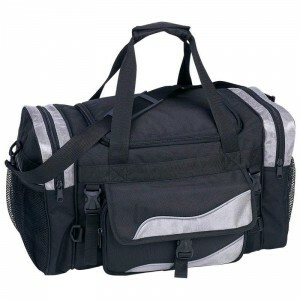 Has two side zippered pockets with a large inner compartment . 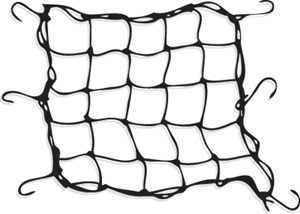 It has two mesh outer pockets and reflective tape for visibility. 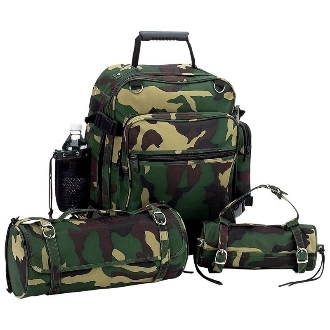 With padded handles and with a detachable adjustable shoulder strap for carrying ease you are always ready. Spring is here. So is the pollen. It just started to get bad within the last few days. I have had to spray off my car every time I have had to use it. It is a good thing I have my scooter cover on my bike. You cannot imagine how much time I have saved myself by having it on, from washing the pollen off and then wiping off the water from the chrome. That means more time for riding. Have you ever been out riding and wished you had something really cold to drink. Well now you can. Here is a sissy bar bag that has a removable insulated cooler insert. 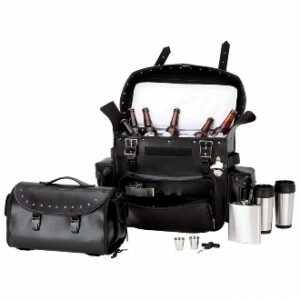 It comes with a bottle opener, corkscrew, two flasks and 2 stainless steel tumblers and 2 stainless steel shot glasses. Not only do you have a cooler, but take the insert out and you have a regular bag. Also you have a barrel bag that attaches to the top. That way you can carry whatever you want.